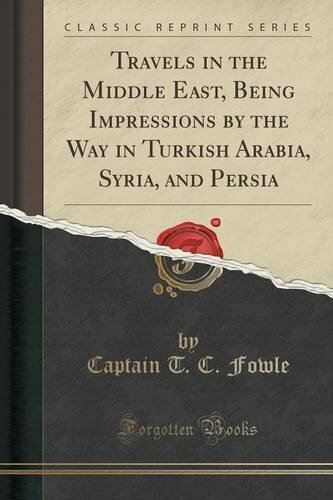 Excerpt from Travels in the Middle East, Being Impressions by the Way in Turkish Arabia, Syria, and Persia The question which is most frequently put to the returned traveller by his kindly, curious friends with regard to the regions which he may have traversed may be summed up in the query, 'What is it like?' It is the question which has most frequently greeted the writer; it is the question which he invariably puts to other returned wayfarers. Some of us may be interested in the politics or economics, the sociology or anthropology, or any of the other more abstruse features of foreign lands, but we are all interested in the 'What is it like?' of them. And what do we mean when we ask this question? We mean, what experiences did the traveller have in his wanderings in those countries? How did he travel? What sort of country did he traverse? Where did he sleep o' nights, and what did he eat? Of what kind were the folk with whom he rubbed shoulders? Did he perchance have any adventures? And so forth. Nor do we expect the traveller in reply to display any undue false modesty in thrusting himself into the background. About the Publisher Forgotten Books publishes hundreds of thousands of rare and classic books. Find more at www.forgottenbooks.com This book is a reproduction of an important historical work. Forgotten Books uses state-of-the-art technology to digitally reconstruct the work, preserving the original format whilst repairing imperfections present in the aged copy. In rare cases, an imperfection in the original, such as a blemish or missing page, may be replicated in our edition. We do, however, repair the vast majority of imperfections successfully; any imperfections that remain are intentionally left to preserve the state of such historical works.